The ruined masonry remains of a tower house sitting on a mound that overlooks Kyleakin harbour. 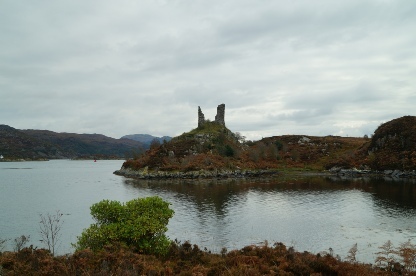 Notes: No sign-posts to the castle but it stands tall over Kyleakin and is easy to locate. Use the central car park in the village followed by a short walk to the castle itself. In wet weather robust footwear is recommended. Commanding the strait of Kyle Akin between the Isle of Skye and mainland Scotland, Castle Moil (also known as Caisteal Maol) was originally fortified before the tenth century. Owned by Clan Mackinnon throughout its long history it was rebuilt in the late-fifteenth century in the form of a Tower House. Castle Moil was probably built before the tenth century by Norwegian forces who utilised the sheltered waters around the Isle of Skye as safe harbours for their warships as they vied for control of Western Scotland. The first recorded reference however is from around the year AD 900 when Findanus, chief of the powerful Clan Mackinnon of Mull, married a Norwegian bride seemingly bringing the castle (also known by the names Caisteal Maol and Dunakin Castle) into his families' hands. It significantly enhanced his power for the site commanded the strait of Kyle Akin between the Isle of Skye and mainland Scotland. If local traditions are to be believed, it may have been the source of considerable revenue earned from a toll boom that barred this key waterway; those that didn't pay would have had to travel south of the Isle of Skye and into the stormy waters of the Minches. It is believed to be here where King Haakon IV of Norway assembled his fleet prior to the Battle of Largs (1263). 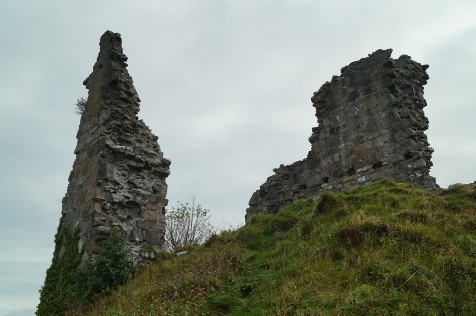 The Mackinnons remained in ownership of the castle throughout the subsequent centuries and their land holdings on the Isle of Skye were enhanced by gifts of territory from a grateful Robert I after his victory at the Battle of Bannockburn (1314). They rebuilt the castle and sometime between 1490-1513 and it is these ruins that are visible today. Originally it was a rectangular Tower House probably three stories tall with supporting buildings - including a bakehouse and brewhouse - in close vicinity. Like the earlier fortification its waterside location (the Lochs and inlets being the key arteries of communication through medieval Scotland) made it an important site. In particular records show a 1513 meeting of Clan chiefs was held here resulting in an agreement to support Donald MacDonald as Lord of the Isles. The castle was abandoned in favour of more comfortable lodgings after the death of Neill Mackinnon in 1601. The site continued to be a key source of revenue for the clan however as they were granted an exclusive licence to run a ferry across strait of Kyle Akin in the early seventeenth century. Following its abandonment Castle Moil was allowed to drift into ruin with sections of masonry falling into the sea as recently as 1989.